Institute is a band from the sprawling land of punk bands known as Austin, Texas. Institute cranks out tunes in the vein of Joy Division, also comparable to early UK punk bands like Crisis. They have set themselves apart with their mid-tempo and thick, frayed guitar tone all fronted by frontman Moses Brown’s sharply moaned perspectives. 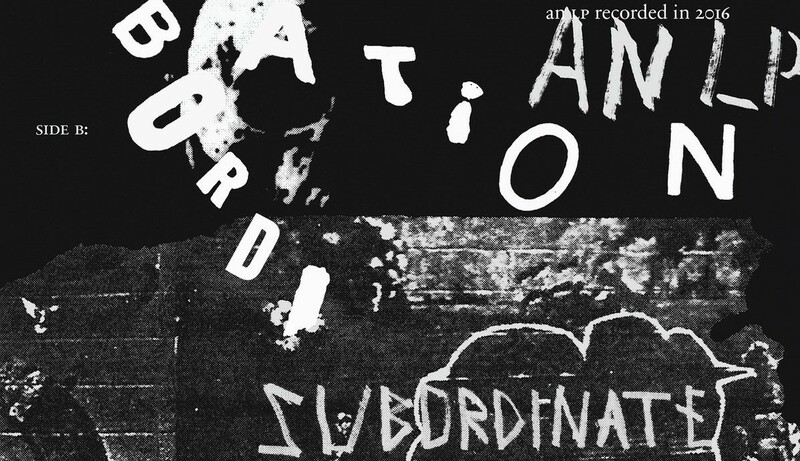 On Subordinate, Institute’s newest LP, the band is in top form. Punk music can go two ways: fast or slow. If it’s gonna be fast, make it fast. If it isn’t fast, make it catchy. Although Subordinate is short, clocking in at 26 minutes, it provides much to be remembered in that small amount of time. The parts of the album that tend to repeat in the mind are the bass lines, especially on songs like “Oil Money” and definitely on “Human Law.” Overall, these punchy lines drive the songs. Floating above the lyrics are melodic guitar lines fulfilling the dark sound that Institute finds easy to craft. Guitar chords teeter the line between feeling happy and sad, but the chemistry between it and Brown is unmistakable. Whenever the guitar work is getting close to happy or sad, it gets darker. It is dark enough to prepare the listener to pay attention and gives a great platform for Brown’s vocal delivery that maintains a laziness while still being urgent. On songs like “All This Pride,” Brown begs people to “…push your ego down as far it goes…” to those who are proud for reasons that are not clear. Other topics tackled on this LP include “the lonely sham of playing by the rules, the search for money and power, the annihilation of a true personality, and the standards of normalcy that from childhood conditions us to feel abject,” according to Institutes write up on their Bandcamp. Verdict: Subordinate, and Institute in general, are kind of hard to explain. They provide a feeling that is specific to them along with a raw, moody sound that is undeniably punk through the tone and topics covered. Only as intricate as it needs to be, Institute has dialed in perfectly with a sound that is unique in today’s punk scene, while also keeping their roots in touch with songs on this new LP that are comparable to the vision they began with on their demo. Looking for a dark and melodic punk record with catchy bass lines and memorable vocals? Look no further! These songs will stay on the mind after only a few listens.